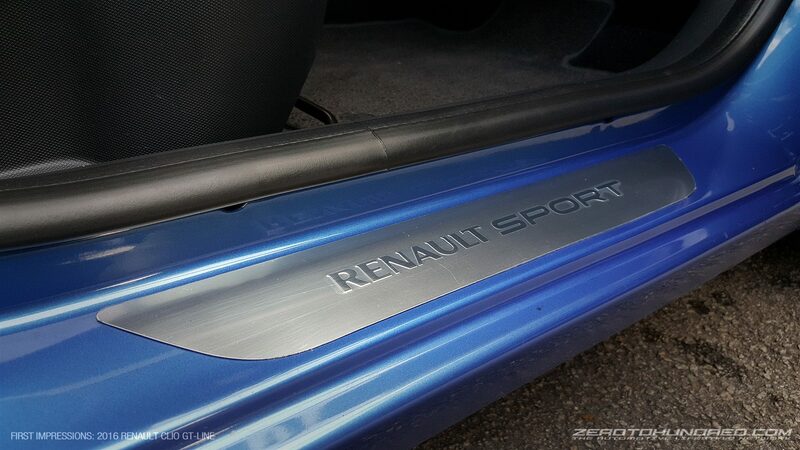 Reviewed: Renault Clio GT Line - 5 reasons why it's not a part time hot hatch. 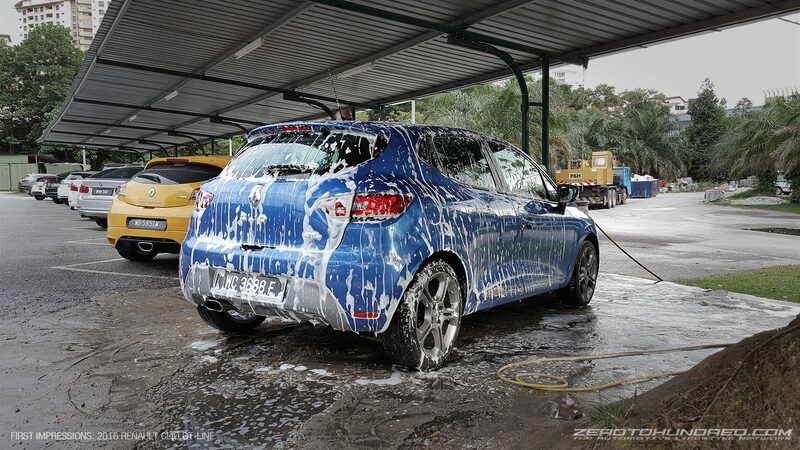 Reviewed: Renault Clio GT Line – 5 reasons why it’s not a part time hot hatch. The Hot: The perfect city car that is efficient and a joy to operate. 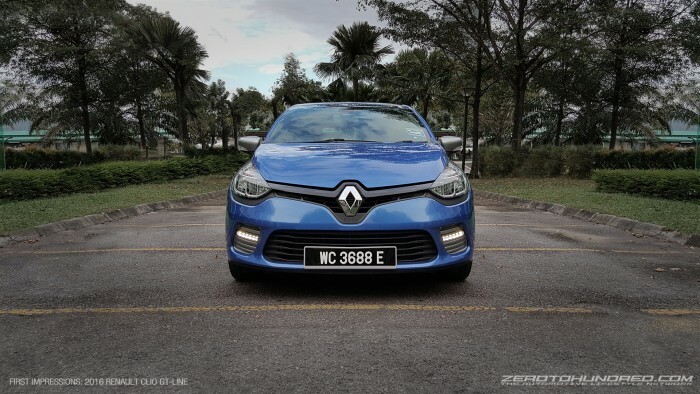 Best looking Clio generation yet, dripping with French flair that is uncommon and bodacious. Equipped with convenience features to match today’s needs and wants. 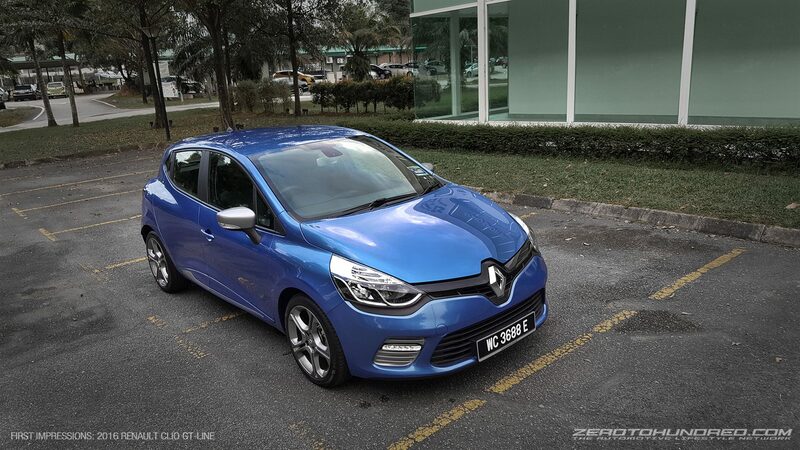 Superb EDC 6 speed Dual Clutch transmission is lifted from the Clio RS. This ‘box is rapid, smooth and faultless. More than decent LG powered entertainment system with great audio and aesthetics. Powerful and is a joy to use especially when matched with lag-free Bluetooth connectivity. Pleasant interior, cockpit designed for drivers. Steering / seat fully adjustable. Fits 4 perfectly, rear seats not bad for a hatch. Good build quality, likely best in its class, so are comfort and NVH levels. The Cold: Hot hatch enthusiasts, please get the RS instead. 1.2L Turbo engine is impressive when boost on climax. Uninspiring when off powerband. Chassis is best reserved for urban and highway operation. It is fun and proper but rather unadventurous when approaching limits. Throttle is elastic, akin to modern hybrids or high-efficiency, low displacement cars. But a non-issue if one masters the said pedal. Brakes are good, however isn’t specced for anything more than urban applications, rear drums doesn’t help either. The GT Line would’ve been a sportier city runabout / weapon if there were steering mounted shift paddles. 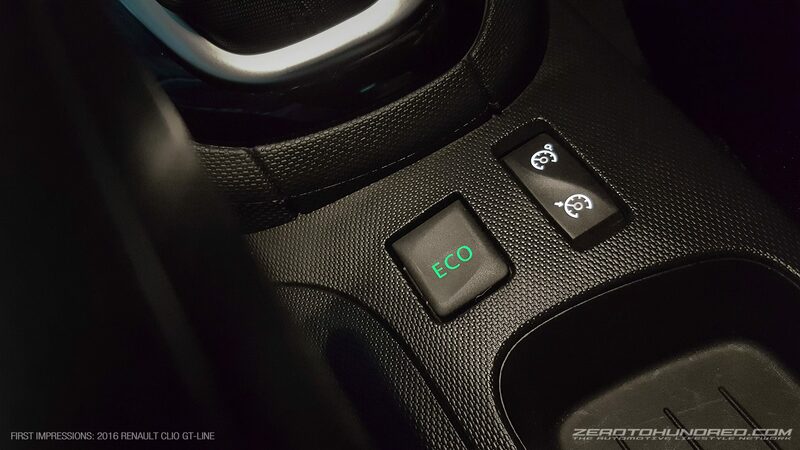 Nevertheless, the shift lever allows manual sequential shifting. 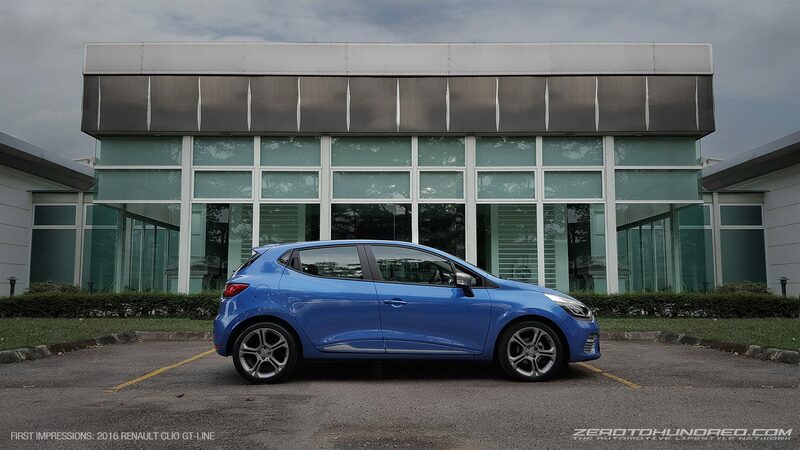 As a proud owner of the Clio RS for over a year, I was eager to taste Renault’s latest offering. 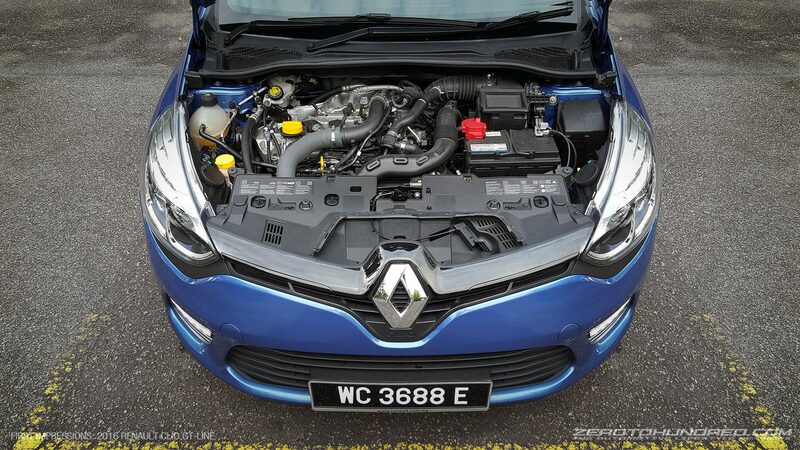 The Clio GT Line, powered by Renault’s first 120ps 1.2L Turbo direct injection 4 cylinder. Conceived to fill the gap in between soul-less small engine compacts and sub atomic hot hatches, this entry level boosted Clio is targeted at first time car buyers and youngish drivers who demand something fresh, European, has zing and is unique. So, this GT Line is based off the iconic Clio with decades of hot hatch heritage, has dual clutch, is turbocharged and got good looks. Judging from the above mentioned attributes, it should fare well as a sporty daily compact while serving as a part time hot hatch right? Wrong. 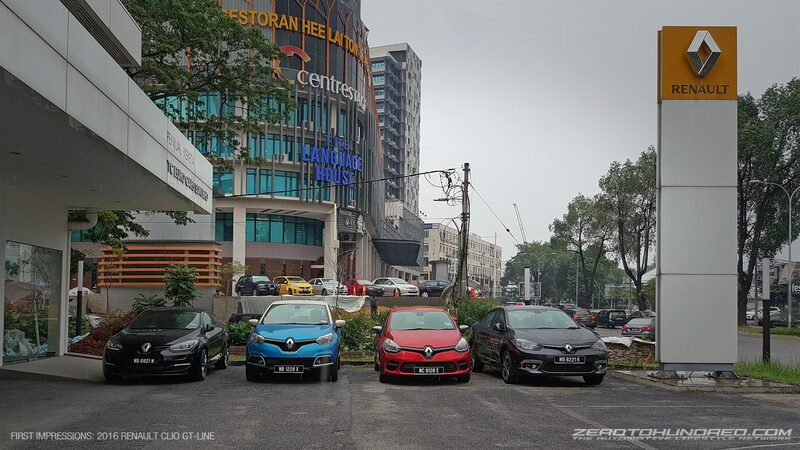 As a daily driving compact car, the Clio GT Line is perfect. I enjoy the practicality it possess especially when it’s got all my daily needs’ boxes ticked. I especially love the familiar cockpit that somehow feels just right. 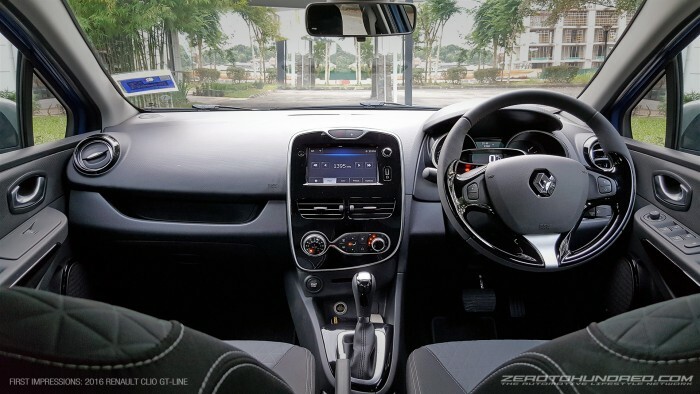 Even someone like Alex Yoong would appreciate the highly personalize-able driving position from both the steering column and the seats. On the aspect of driving ambiance and tools, it’s all there, well sorted and likely class beating too. 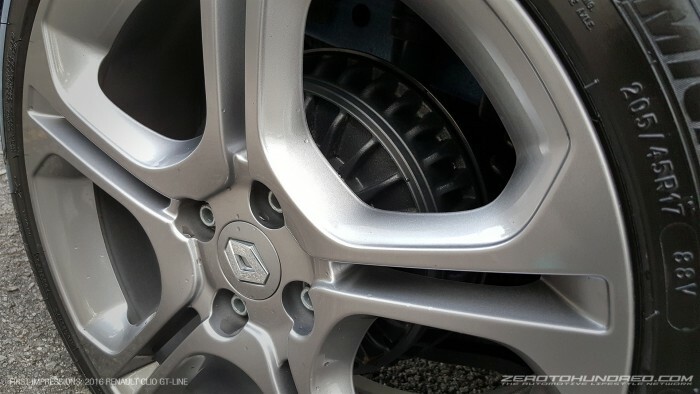 The Clio GT Line’s dry system EDC dual clutch gearbox is taken from the bigger brother Clio RS and is one of the best dual clutch transmission there is. 1 year and 35,000km into my ownership, it never skipped a beat, road or track. In automatic mode, this ‘box is smooth and sedate. It is the only available mode in the GT Line. One can say it’s overkill to have such a well engineered transmission in the 120ps Clio GT Line, but still, it’s a good thing. No faux leather or cheap plastics here. I like how the grey fabric seats feature puffed diamond motifs while the edges are stitched in white. Ergonomics wise these seats are comfortable, however only the driver’s can be raised or lowered. There’s plenty of silver / black accents here as well and is just a pleasant place to be in. Off the line from dead zero, boost is immediate and the Clio GT Line is acceptably quick. Matching the likes of 1.6 – 1.8L NA engines. However, power tapers off from mid range onwards. No matter how efficient this boosted 1.2L is, its lack of displacement simply doesn’t allow it to build the sort of pace that is deemed sporty. Drive it normally like you would when ferrying your parent-in-law, the Clio GT Line is sublime. It gains momentum with ease, is jerk free, harsh-less and enjoyable. Suspension is compliant, supple and has decent travel. A candidate that is likely to get any mum and dad interested. But try pushing beyond its purpose and the results is likely to frustrate. Firstly, there’s the ever elastic throttle pedal. 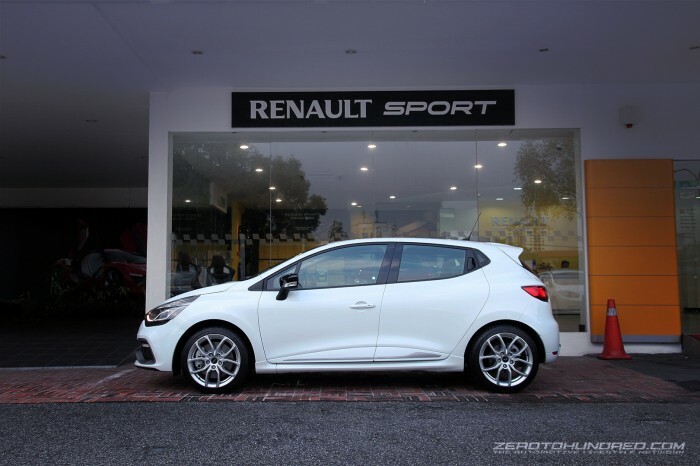 Just like a hybrid car that is assisted by an electric motor or any modern, turbocharged small displacement engines, the Clio GT Line seems to bog down whenever it senses disturbance in the boost force. Mostly during enthusiastic moments, city stop-go traffic or uphill driving. Okay, I have to say the in car entertainment system in the Clio GT Line is one to be praised. 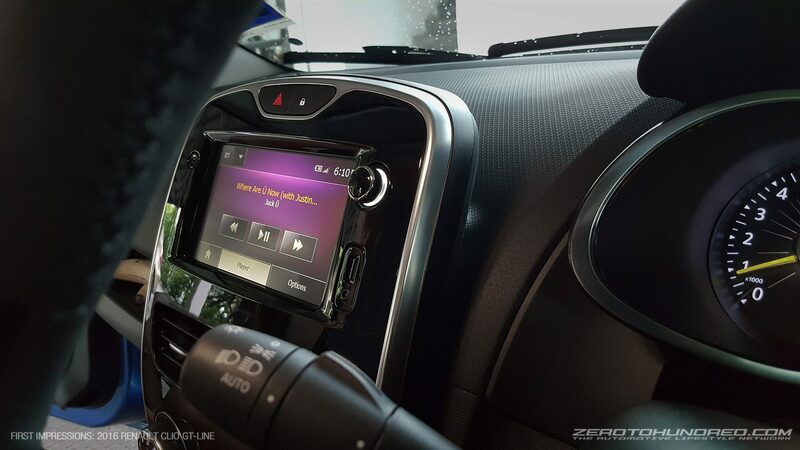 In my past review, I mentioned the system in our Clio RS is pretty decent. I take it back. This LG powered system in the Clio GT Line makes the one in the RS sound like a phone speaker. Yes, bass and treble here is impressively crisp and boomy. I especially enjoyed the experience when paired to a smartphone while playing my Spotify playlists. It was flawless. 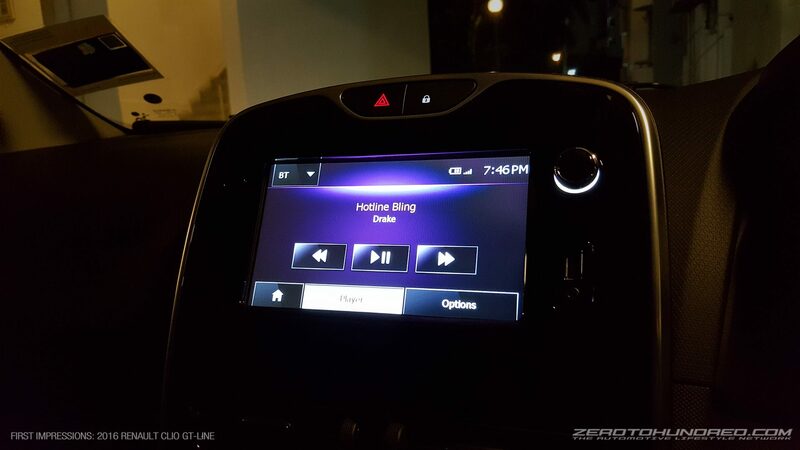 Also unlike the one in the RS, this one is equipped with later versions of Bluetooth resulting in lag-free skip and play. Even the UI in this LG unit looks and works better. Definitely a turn on for the young and the hip. One needs to look at the GT Line not as a hot hatch but as an alternative to the mainstream compact cars available on the market. As a daily compact hatch, I love the simplicity in operation of the GT Line. EDC Transmission is icing on the cake and a perfect match to the cutting edge 120ps 1.2L turbo engine. A bullet proof package that when used properly, will provide years of commuting enjoyment. It’s got a good cockpit, includes convenience features most people want, such as keyless entry / start, automatic lights, a usb / bluetooth supported / media playing LCD entertainment system that is powerful and more. 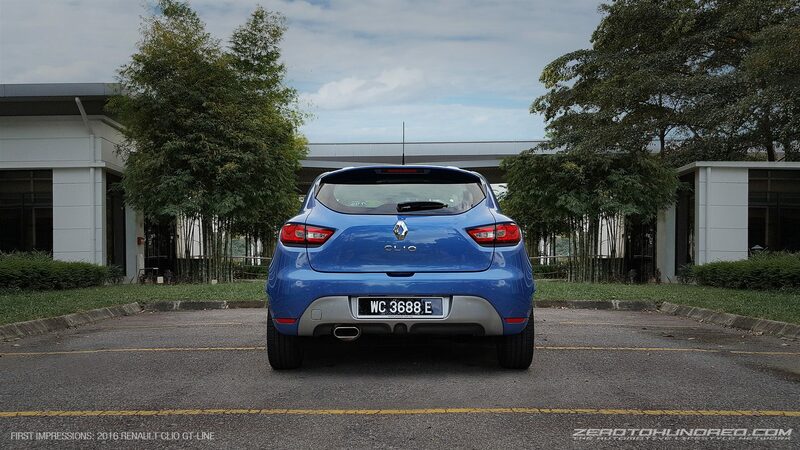 Even till today, I find the curvy physique of the Clio 4 alluring and unique, especially its rear end. There just isn’t anything like it. I mean, look at the Clio’s closest competition, the Fiesta or the 208 or the Polo. They scream mainstream. All in all, I would only recommend the Clio GT Line to people who are looking for practicality as opposed to performance, logistics over lap times. If ever you have a doubt that the Clio GT Line may not be spicy enough, chances are you are right. Get the RS. Either way, you should visit their showrooms and try it out for yourself. 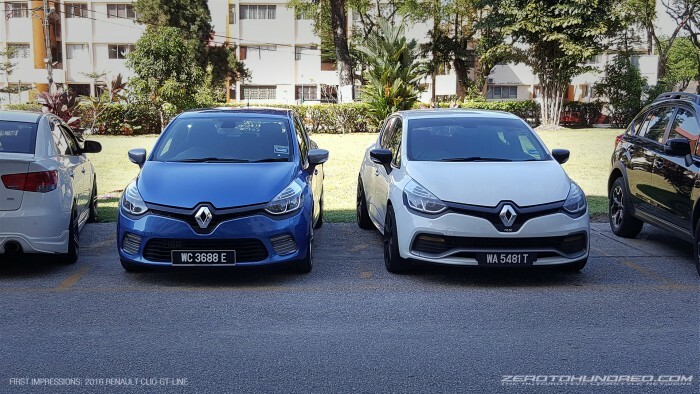 Sign up for their no-strings test drive, check http://www.renaultclio.com.my/ Where both the Clio GT Line and the Clio RS are comprehensively showcased!